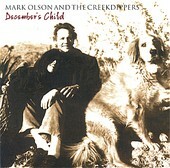 Blues-tingled, winter-minded Americana, the leaves of fall have all disappeared as winter sets in, and Mark Olson and the Creekdippers' December's Child plays. Strong lyricism alongside roots-y, rustic rock, golden harmonies, all infused with settled-in melodies, December's Child plays like a classic, warming you up more than the dying fire in the core of the house. It is a the sound of Americana being fully realized, the red, white, and blues of the nation being lived day by day by those who understand the urgency of Americana, especially as of late. I'll give it a B+.